Thinking about Having a Fire Outdoors? -In the town of Farmington, open burning is only allowed when the air quality is good, and the fire danger is low. -To obtain a permit or to see when open burning is allowed contact the town fire marshall. 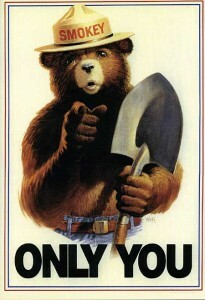 -Air quality and fire danger information is available 24/7 at http://www.ct.gov/dep . -When having an outdoor fire for debris removal or recreation, be sure to have water nearby in case the fire gets out of control. -Prior to lighting the fire, clear the area three feet back from the fire of leaves and dried grass by using a rake or leaf blower. -Never leave an outdoor fire unattended. -Check proper functioning of extension cords, there should not be any sharp bends or splits. -Change smoke detector batteries. Read more here! -Make sure vents, filters and air handlers are clean and de-winterized. On outdoor air conditioner units, remove the door to the electrical components to check for and remove any animal nests. -Perform maintenance to lawn equipment. -Let motors run to ensure they are running properly, watch for leaks and unusual noises. -Let the equipment sit for approximately 30 minutes before placing it inside to be sure there is no possibility of fire. -Do not fuel equipment indoors, in confined spaces, or while the equipment is running. -Check all outdoor lighting for animal nests and to ensure proper wiring. -Check and clean the gas lines and pipes on propane and natural gas grills. -Do not place grills, stoves, or outdoor chimneys near a house. -Coals and ashes can hold heat for days. Do not place coals or ashes in the garbage, or carelessly dispose of them. Use PLENTY of Water! -Watch the NFPA video here about Safe grilling. A Red Flag Warning also known as a Fire Weather Warning is a forecast warning issued by the United States National Weather Service to inform area firefighting and land management agencies that conditions are ideal for wild land fire combustion, and rapid spread. After drought conditions, when humidity is very low, and especially when high or erratic winds which may include lightning are a factor, the Red Flag Warning becomes a critical statement for firefighting agencies. These agencies often alter their staffing and equipment resources dramatically to accommodate the forecast risk. To the public, a Red Flag Warning means high fire danger with increased probability of a quickly spreading vegetation fire in the area within 24 hours. Dear parents & educators have a look here. Did you know 9 out of 10 wildfires are started by humans ? Visit Smokeybear's website and learn how to prevent wildfires.